a lighting creator based in Villeurbanne, France. Since I started the brand in 2010, I've been working on a contemporary lamp line inspired by industry, composed of articulated and adjustable wall lamps, simple and double arms and chandeliers. The first one when I select, restore, and enhance vintage industrial lamps. And a pretty new line, that I've started a few months ago, my very own handmade collection. I use elements produced by craftsmen from the Lyon area just for wo and we collection. They're all unique and customizable. I'm very proud of this part, I mean its a brand new way of working and it's so appreciable to be able to call it MY collection! Jean Prouvé's work is an unfailing source of inspiration. 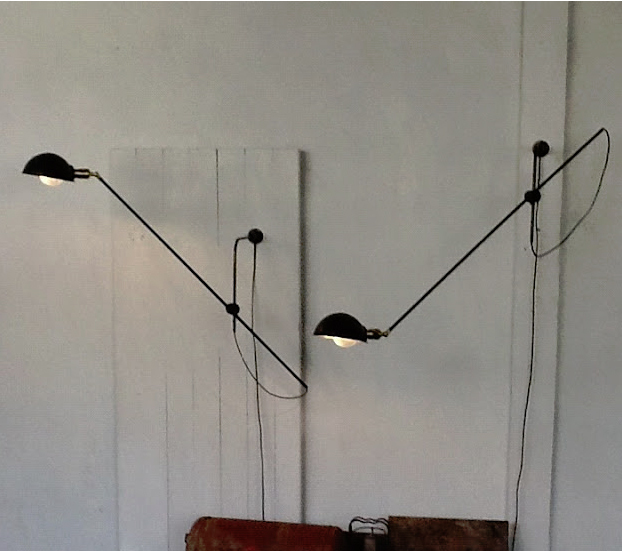 Charlotte Perriand's and Serge Mouille's are too.I like a lot of very different lighting designers. From Will Rietvelt to Pierre Guariche, from vintage O.C. White to Achilles Castiglioni and from Isamu Nogushi to Joe Colombo. I used to work as a manager at Pier Import across the Lyon area for 25 years. My decision to quit came out of nowhere after a few years of making lighting for friends and family. Each Sunday morning, you can come across me, loafing in "Les puces du canal," Lyon's flea market. I meet my antiquarian friends there, and there's always a free spot for a newbie! I also like to stop by Auguste Comte street, downtown, because of all the antiquarians, art galleries and my "must see" shops "Bensimon home" and "Maison hand"
To me, Apartamento is the greatest interior magazine. I read each article with utmost attention. I'm kind of an art reader but I also enjoy architecture books, and US literature (Jim Harrison, John Fante...). I just finished and loved "Hollywood Babylone" written by Kenneth anger. I am not a cook at all (even eggs can be tough), thank god my wife is the finest! Lee Azelwood, Alt J, Feist, Damon Alban, Six to Rodriguez, Vampire Weekend. New meetings, a new collection and new shipping places for my lamps! I'm not exactly a great traveler, but I love when the postman asks me "where are you sending your lamp, this time, Olivier?" I am happy to answer UK, Taiwan Poland , Australia or USA!